Berkshire Earth Expo is a community fair focused on energy efficiency, climate resilience, and the protection of nature and our health. It is an event where visitors learn and take action to reduce their energy use and save money. 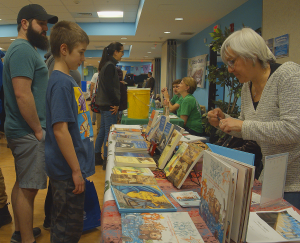 On April 9, 2019, this unique event featured local students’ exhibits, eco-friendly vendors and organizations, food, games and fun for the kids, arts and crafts, WordxWord, and much more. With the new Cooler Communities Challenge, individuals, families, and businesses had access to easy and convenient steps to reduce their carbon footprint. By accessing the resources and presentations at the expo, visitors made pledges and learned how to adopt new habits that made sense for them. These actions are not only be good for the earth, but will save money and time. The pledges of all attendants will be added up to determine the collective reduction of our community’s carbon footprint. For every pledge sheet turned in by visitors at the expo, Berkshire Children and Families received a $5 donation from our co-sponsor, ener-G-save! Students at Berkshire County schools have taken on the Cooler Communities Challenge and presented their work on climate and environmental classroom activities. These student exhibits enlivened the Expo and inspired all of us to do whatever we can to ensure our young people have a livable future! Muddy Brook Elementary School, Great Barrington — The Muddy Brook Green Team presented their work on composting at their school and why it is important to compost. Bard Academy at Simon’s Rock — Tate Coleman is a student at Bard Academy who presented his work on public transportation in the Berkshires. 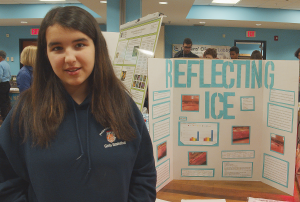 Students of Professor Michael Bergman did a presentation of the science of climate change. 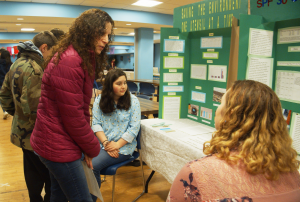 The Darrow School, New Lebanon, NY — Darrow Environmental Science students and their teacher, Leah Penniman, presented their research on solutions for feeding a growing population without squandering the earth’s resources. Combining soil science, food justice audits, and climate analysis, Darrow’s young scientists chart a way forward to a sustainable food future. Miss Hall’s School — 10th Grade students presented their campus efforts to reduce and ultimately eliminate single use plastic bags and offer tips for more green practices while using reusables. 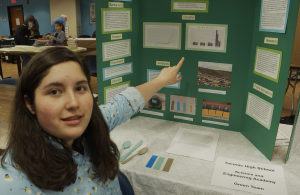 Taconic High School — Students brought their science fair exhibits related to climate/energy. Waconah Regional High School — Students shared their experiences and methods in researching and implementing a school-wide cafeteria composting operation to reduce the amount of waste from their school going to landfills. Vendors and Organizations who attended this year! Judy Fox lives in a warmer house thanks to Mass Save! Make your own storm windows! Copyright 2019, Cooler Berkshires, a project of Living the Change Berkshires.